Yoga may be one of the most universally relevant exercise regimens for the person trying to recover from illness or injury. It also helps people get in shape and build their balance, and can be performed by people of all ages. You may not, however, considered the benefits of plants in your yoga environment. As you even out your mind, thinking, and speech, you can bring orderliness to your life, clearing the way for energy to flow around and through you. As part of the flow of energy, plants can aid in the purity of your yoga environment. This is possible not only from a metaphysical standpoint. While there is much to be said for the placement and types of plants in such an environment, the pure, scientific fact is that plants purify the air. NASA and university scientific studies have proven that the air in your home can be purified by plants. They absorb gasses in the room through surface space on the leaves. The absorbance of these gasses makes it easier for them to synthesize light, turning it into energy. Plants absorb carbon dioxide, converting it to oxygen. This creates a more healthy atmosphere in the room, with more oxygen-rich surroundings. But, plants don’t stop there with their intake. They also absorb VOCs, or volatile organic compounds, that are gases exuded by some of the fabrics and chemicals that surround us. Plastic and many fabrics exude Benzene. But, plants can absorb these gases and convert them into oxygen. Pesticides and cigarette smoke also contain Benzene. You may have encountered the experience of such chemicals coming into your home and polluting the atmosphere. Plants can help to counteract that damage. There are many VOCs, that can enter your home. These VOCs are in fabric softener, dish soap, and even makeup. Formaldehyde and ozone are also VOCs that are present in many products that we use every day. Plants can purify indoor air through a process called phytoremediation. Not only do the leaves and roots of the plant filter out the gasses, turning them into oxygen, the microorganisms in the potting soil help to break down these pollutants. So, if you were going to buy or hire plants, which ones should you go for? 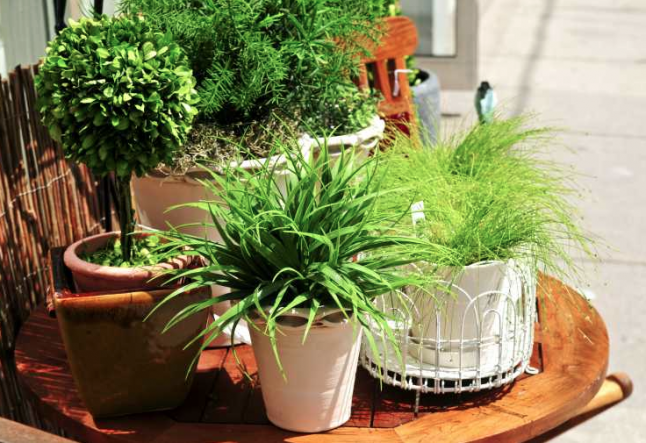 In general, the more leafy plants are better at purifying air. Ferns, for example, have a great deal of surface space. The ruffled leaves increase the surface space available for converting gases, and the small, plentiful leaves also contribute to surface space. The fern is especially adept at converting formaldehyde to oxygen. The rubber plant has large leaves, and is very sturdy and hardy. This is another good formaldehyde converter, pulling the gas from the atmosphere polluted by gases from laminate flooring, carpeting, ceiling tiles, and gas stoves. Pothos Ivy is another great choice of plants for you yoga environment. The sturdy plants are lovely, and can grow in just about any condition. English ivies have smaller leaves, and can be trained to grow around topiary forms, while the pothos ivy can be allowed to trail or wrapped around an obelisk topiary. Areca palms actually help to increase the humidity of your surroundings. This can provide valuable balancing of climate control versus the need for moisture to maintain healthy tissues. The palm is also great if you are allergic to dust, because of the hydrating effect it has on the atmosphere. The dwarf banana also transpires moisture at a tremendous rate, making it great for hydrating a room. The peace lily is one of the most versatile and resilient plant to have in your yoga environment. It converts many different VOCs, including trichloroethylene, benzene, formaldehyde, and alcohol. Plants have a way of presenting visible calmness into a room. Rather than presenting clutter, the shape, scent, and purpose of plants can offer focus that takes you closer to nature. Your yoga environment should be relaxing, inducing calm. The noise producers in your home, whether those be the television, a roommate, or kids playing, should be in a different part of the house. Light in the room should be as natural as possible. In fact, the more natural light you can have in your yoga environment the better. The sun has a purifying effect, and creates life in the plants you include in the area. A calming color on the walls of your yoga room will continue to bring a sense of peace, as well as encouraging you to relax as you begin your exercises. Make your room as natural looking as you can. The more plants you have, the better, with the ruffles of leaves breaking up the visible plains in the room, breathing with you as you work out. You will become more aware of the faint scent of the greenery and the potting soil, breathing in the purified air from the plants as you go through your routine. The balance achieved both visibly and physically will enrich your life. So why not add plants to your yoga environment to get the most from your yoga workouts! Laura Green works for Yeotown, a yoga and health spa in North Devon where you can enjoy the beautiful scenery and coastline.